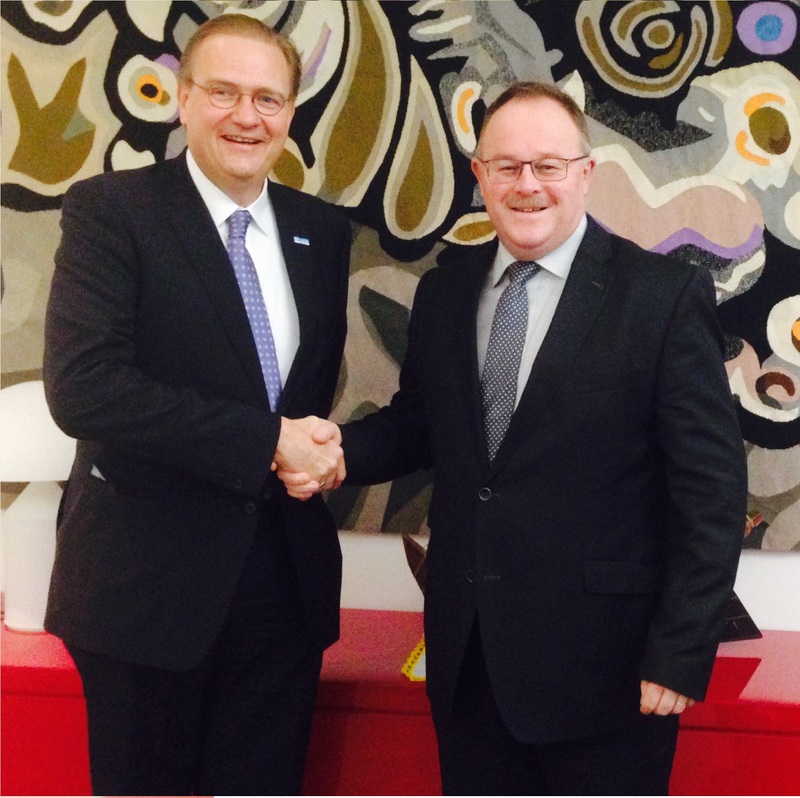 On Wednesday February 11th, the Executive Coordinator of the United Nations Volunteers programme (UNV) Richard Dictus, met with M. Romain Schneider, Minister of Luxembourg for Development Cooperation and Humanitarian Aid in Luxembourg. Were also attending this meeting, Mrs Martine Schommer, General Director of Luxembourg Development Cooperation and Humanitarian Aid; M. Marc Pitzen, Senior Inspector for the Development Cooperation and Humanitarian Aid and M. Georges Metz from the Ministry of Education and Youth in Luxembourg. This significant and constant collaboration between UNV and the Government of Luxembourg exists since 2001, and has been confirmed several times, including in June 2012, when the Government of Luxembourg signed the last Fully Funded agreement. This week important meeting aimed to consolidate the long-established partnership between UNV and the Minstry of Cooperation and Humanitarian Action of Luxembourg in favor of promotion of volunteerism as powerful tool to tackle the challenges of sustainable development. Luxembourg is also a unique partner for UNV by supporting the South-South cooperation. In that sense, as well as fully funding its nationals from the Grand Duchy, Luxembourg also fully funds International UN Volunteers coming from the South deployed to assignments in the South. Every year, its about fifteen International UN Volunteers, nationals of Burkina Faso, El Salvador Laos, Mali, Nicaragua, Niger, Senegal and Viet Nam that are fully funded by Luxembourg. By supporting the South-South Cooperation, the Grand Duchy allows nationals coming from developing countries to work together, to share their knowledge, their expertise and their lessons-learned. Luxembourg is also a reliable supporter of the UNV Youth programme to promote and advance the role of youth in development through volunteerism, as for the mandate received by the UN Secretary General, and confirms its commitment and interest in the promotion of Volunteerism for peace and development. Therefore, the Grand Duchy is financing for the first time 4 national UN Youth Volunteers to be deployed in Cabo Verde, Senegal and Vietnam.